Abigail has been potty training lately. I anticipated that this would be a substantial challenge, but as with most things, Abigail has taken right to it. On the second or third day, I sat her down on the potty and started fishing through her stack of books, figuring we’d need to be there for a while. I heard that distinctive tinkling noise and expressed my excitement with some enthusiasm. Abigail seemed unmoved by the moment’s significance. “I’m all done,” she said. She’s spending her whole day in underwear with no accidents at this point, although we still have her in diapers for naps and bedtime. It’s only been a week after all. This system does require frequent visits to the potty, about half of which are fruitless. At least, if you consider reading stories and lauding the virtues of toilet-centered bowel evacuation fruitless. We’re still on the lookout for the elusive poop, which has yet to poke its shy head out when the toilet is in play. That hasn’t stopped her from pooping, mind you. In fact, she had a pretty substantial one at swim class the other day, something she hasn’t done since she was a baby. By the time we noticed the lump in her swim diaper, it had already metastasized, spreading out into the secondary swim diaper and the suit itself. I knew there might be an issue when Jessica took Abigail to the bathroom to clean it up, but I was blissfully unaware of the depth of the problem until it took her about 10 minutes to return. Even then she had to go back to finish cleaning the surrounding area and, I’m guessing, put up the biohazard warnings. Abigail seems to really enjoy using the potty, at least when it doesn’t interfere with her spinning wildly on the grass time. In fact, if we’re putting her to be, she absolutely loves going to the potty and wants to do it every five minutes or so. She used this con to great effect a few days ago. It’s much more effective than shouting, “Wolf!” Particularly if your room is on the second story of a suburban San Diego community. “Coyote!” might work, but “I have to go pee-pee on the potty” really hits the right triggers in a parent’s brain. Hopefully we’ll get a poop soon. Mostly because I want to use that tag again. 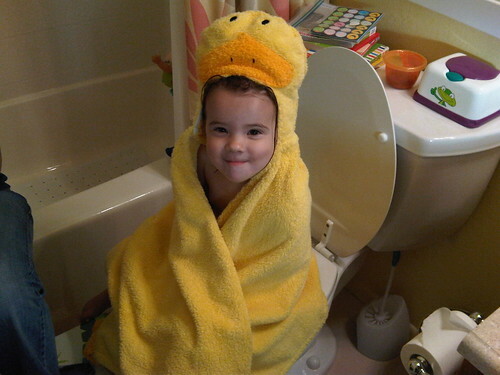 This entry was posted in Abigailia and tagged Duck Towel, Pee, Poop, Potty Training. Bookmark the permalink. It takes between 6 and 9 months (best-case scenario, actually) for an item to purge from search engine caches, beginning from the moment of initial deletion. Some deleted items remain cached for years. I only mention this in anticipation of Abigail’s eventual discovery of this post. Oh, I plan to collect all these things for the future enjoyment of her and any potential love interests she may bring home. If Abigail murders you in your sleep 20 years from now, just know that it all started with the posting of this photo. Potty pics as prophylactic. What I thought was folly has now been clearly revealed as genius.